The Alpha a7R Mirrorless Digital Camera from Sony incorporates a full-frame Exmor CMOS sensor into an E-mount body thus providing the light gathering capability and detail-rich imaging of a full-frame sensor with a compact, lightweight and versatile mirrorless interchangeable lens camera system. 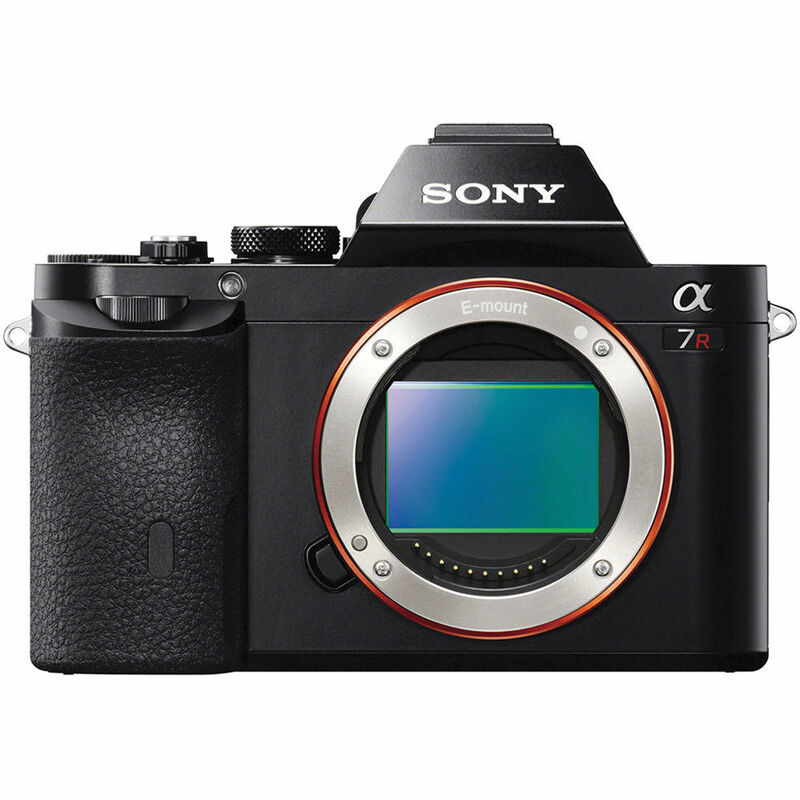 Differing from the full-frame Sony Alpha a7, the Alpha a7R omits the low-pass filter from its 36.4MP sensor, thus optimizing its high resolution, detail-rich imaging capability. In addition, the sensor features a new gapless lens design to increase corner-to-corner light collecting efficiency.The standard ISO sensitivity range of 100-25600 provides rich saturation in bright light and clear, low-noise images in low-light situations. Alpha a7R Mirrorless Digital Camera is rated 4.5 out of 5 by 119. Rated 5 out of 5 by Tim the Thaifoon from Embracing the Future I have been working on a long term Landscape project in which I have been lugging around Medium Format equipment all the way up to 8x10 field cameras. I may have to hike 10 miles through the night to get to a sunrise that doesn't work out and hike back out with no image. This camera seemed promising so I jumped in. I took the camera out for the maiden voyage and walked away with keeper, one I'm really stoked on...of course, Mother Nature was on her best behavior...but the quality of the file is magnificent. I recommend this camera for photographers who take time in capturing their images...tripods, quality light...patience. Rated 5 out of 5 by Sharpeyes from A Stunning Camera I use this camera to undurden me from my D3s for most everyday use. I didn't realise how good it is. The only thing I will use my Nikon for is lightning photography. The Sony is coupled with a 35mm prime (Zeiss) but it works very well with the Nikon 16mm and 14-24mm with a Metabones adaptor. A little bit more fidly using them in manual but carrying a heavy bag is a burden too far. In all shots the image is amazingly sharp. All I need now is a sturdy lightweight tripod. I upload to my Mac using 'Import' in LR5 with no issues and the file size (RAW - 36MB, Tiff - 200+MB) presents no problem to my set up. All lens corrective plug-ins are there. Rated 5 out of 5 by Egill Bjarki from Compact and SUPER capable This little thing along with the FE 55mm is just about the most powerful combination you can get, let alone for that price! I never travel with a DSLR anymore, my professional travel kit consists of A7R and A7S along with native glass.The camera is rivalled by Nikon D810's robustness and focus speed. The two cameras are widely believed to have the same sensor. The A7R does for some reason have a little less dynamic range than D810, even though it blows just about everything else out of the water.In the past, I always carried two DSLR's to assignments (for backup). Now, the A7R is a equal member of my kit, even preferred over the DSLR because of it's unique compactness and power. Rated 5 out of 5 by Bob F. from Almost perfect There is no perfect camera, but his one gets close. Much has been written about the image quality so I won't go into that other than to say it is stunning. In my humble opinion, the user interface, menu layout and button programability makes this camera a super winner for me. Like I said, nothing is perfect but if you can't set this puppy up to work exactly the way you want it to 95% of the time, then, well I don't know if there is an answer for you. It is extremely versatile. And setup works for me 99% of the time. The one percent, you ask? I wish it had 3 presets modes like the RX-1r instead of 2. I can live without it. No big deal. Rated 5 out of 5 by Dale of the North from Just what I wanted The A7r was the camera I started dreaming about as soon as I got my RX1. It takes a similarly sized compact body and lets you mount the new FE lenses as well as just about anything else you'd like to try via mount adapters. Everything from old Pentax screwmount lenses to A-mount Zeiss lenses are a delight on this, thanks to its focus peaking and wealth of other features. I'm glad Sony listened to its NEX and RX users, as it seems they've addressed so many concerns. As a result, the A7r has all the features I've been wanting as well as so many bonuses (video, audio, 4k out). But, at the end of the day, the real draw is the image quality. I'm getting incredible results so far. Jaw-dropping stuff. Rated 4 out of 5 by Anonymous from It's a keeper I shoot B&W landscapes for sale, display, and fun. Much is while on travel and hiking. This camera with it's 35mm Zeiss-designed lens allows me to capture, hand held, more high resolution images than the alternatives I've used, including the Leica M9 and a lot of medium format film cameras. The bad news is that my Leica M-mount optics wider than 50mm smear at the edges. From 50mm up, they are outstanding. Don't bother with the cheaper adapters. The shutter is not Leica smooth, but it's not bad. Get the charger and an extra battery. Is the a7r a suitable replacement for high quality film like video production? If not what to suggest in a full frame compact size camera. Thanks. The Sony A7R is an excellent option for shooting video. It is capable of full HD in various frame rates at 1080, including 60p, 60i and 24p with uncompressed HDMI output. It is possible to use my Zeiss lenses of my Alpha 850 in this body ? You would be able to use Zeiss lenses with a Sony A mount by using this product, B&amp;H # SOLAEA4, http://bhpho.to/1bKe4G. I have 1980's vintage Summicrons 35 and 50 as well as Tele-Elmarit 90. They were designed for film i.e. no consideration was given to the angles of incidence at the image plane. How would they perform on a Sony a7r? Intervalometer for timelapse? - is there any accessory to control the camera for interval shooting? Does the older minolta remote still fit using the minolta plug or is this USB now? The only remote currently available for use with the A7R is the RM-VPR1 remote control, seen here: http://bhpho.to/1fsJROb. Hopefully, in the future there will be other options. Is there an adaptor that allows Canon to Sony E mount and will retain metering and auto focus functions? Metabones has a Canon EF to Sony NEX adapter, B&amp;H # MEEFEBM3 , http://bhpho.to/15iyZXZ. This adapter will allow the lens to function with autofocus and metering. What are the bracketing option including exposure range and number of shots? The a7R has an exposure range from 0.3EV to 3.0EV. From 0.3EV to 0.7EV one has the option of shooting either 3 or 5 images, and at 1.0, 2.0 and 3.0EV one can shoot only 3 images. What lens adaptor would I need to use my Leica lenses on the Sony a7R?